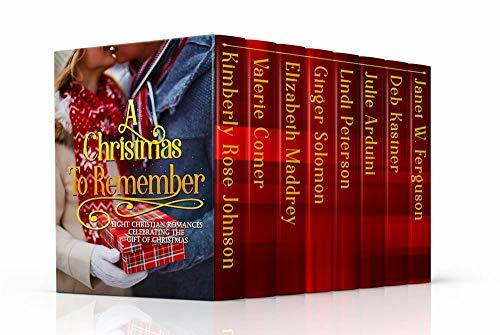 A Christmas To Remember is a perfectly delightful set of eight contemporary Christian romances set around Christmas. The true meaning of Christmas is shared from the deep snow to the sandy beach. Similar themes of caring for others, forgiveness, hurt, trust, grace and God’s love unite the tales. Warm, welcoming and wholesome characters entertain the reader. It was impossible to have a favourite as all the stories were delightful. You do not need to wait until December to experience these wonderful tales. Until I Met You by Kimberly Rose Johnson is a delightful festive romance to kick off the collection. With hot chocolates and flavoured lattes, carols and inclement weather, the Christmas atmosphere is warm and welcoming and perfectly captured by the author. Focusing on God and putting Him first ensures we have the correct priorities. Looking out for the less fortunate and opening hearts and homes to all really encapsulates what it means to have a Christ-like heart and outlook. The Cowboy’s Christmas Reunion by Valerie Comer is another wonderful offering focusing on God’s gift of grace and second chances. It’s never too late to have a fresh start with God. Valerie Comer shows the importance of family and community. There are two wonderful young children who will just melt the reader’s heart. Their mannerisms have been perfectly captured. Inclement weather serves to add to the cosy atmosphere as characters bond around food served by huge hearts. Hope For Christmas by Elizabeth Maddrey is a delightful offering focusing on the greatest gift of all – Jesus. The story revolves around the topic of childhood diabetes. It is scary being responsible for calculating just how much food is needed to balance the sugars. The reader sees the emotions a mother goes through. Eyes are opened to Jesus. We witness the birth of a new Christian which mirrors the celebration of the birth of Jesus. Hearts and homes are opened as relationships are restored. Another wonderful offering from Elizabeth Maddrey who writes about real issues that affect people’s lives today. Can’t Live Without You by Ginger Solomon is a delightful tale focusing on betrayal, hurt, forgiveness and the grace of God. In our pain we may ignore God but He waits for us to return to Him. We need to wait on Him and His perfect timing and plans. There is the theme of taking care of the innocent. A beautiful three year old will capture your heart. Beautiful Heart Of His by Lindi Peterson is a wonderful tale to warm your heart. With themes of hurt, betrayal, grace, forgiveness and covered by the love of God. God is the God of new beginnings. We can trust Him and His timings. There is a warm atmosphere enveloping the tale as characters reach out to those in need. It will leave you smiling. Restoring Christmas by Julie Arduini is a delightful fun tale surrounding celebrating Christmas. When life hits again and again, sometimes we get angry and turn from God. God awaits our return. Family and friends pray for us. In our pain we shut out people. We need to learn to love and trust again. An outspoken tween is delightful – both amusing and truthful in their observations. A wonderful tale of forgiveness and fresh starts. The Cowgirl’s Christmas Gift by Deb Kastner is a perfectly lovely festive story focusing on animals, family and celebrating the season. Two delightful six year old twins entertain the reader with their exploits. A horse sanctuary warms the reader’s heart. Interactions with humans rather than technology enables a recluse to re-enter the world. A backdrop of snow creates the perfect atmosphere. Falling For Grace by Janet W Ferguson is a delightful poignant story to end the collection. We are all broken vessels travelling along the road of life. We can help each other heal. Withdrawing from the world and God is not what is needed. We need community and God in order to move into the future. Memories can hurt. We need to keep smiling in spite of the pain. Wonderful characters amuse the reader with their banter and their propensity to being accident prone. A wonderful tale that leaves you smiling. Hi Linda! I hope you enjoy the collection! It was fun to be a part of it! Thank you so much for taking the time to review the stories! This is my first time being in a collection and writing a novella! I enjoyed working with the other authors! I like your blog!! I’m so glad you loved this collection!